Sophia A. Nelson is an award-winning author and award winning journalist. She is also a highly sought-after corporate leadership trainer and motivational speaker. Nelson has a national platform that is making strides to help women lead more fulfilling and powerful lives in and out of the workplace. OUR FOUNDERS understood that America was the greatest experiment on earth. 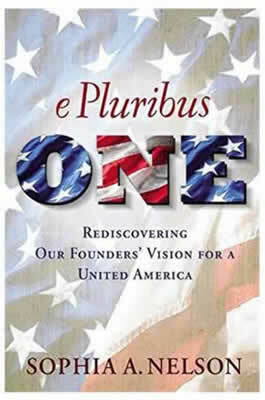 And they sealed it with these words: E pluribus Unum: "Out of Many We Are One." "America is the story of us. And us isn't doing so great right now." Says award winning journalist and author Sophia A. Nelson. Coming on the heels of the raucous and divisive 2016 general election campaign, Nelson attempts to give the nation an inspirational charge and lift by helping us to reclaim our founders' vision for a united and strong America. Nelson reminds us that "we the people" are charged by our founders' to cherish life, liberty, freedom and equality, as well as to safeguard the nation from intrusive governance. The founders' also charged our leaders to be moral, virtuous, patriotic servants of the people. We are ONE nation indivisible with liberty and justice for all. Pulling from our founding fathers' core principles of liberty, citizenship, morals, virtues, civic engagement, equality, self-governance, and, when required, civil disobedience, Nelson calls us to a higher standard. She calls us to purpose. And she calls us to rediscover the things that unite us, not divide us. One is a book that all Americans, regardless of political party, race, religion, or gender can embrace and share with their children and grandchildren for generations. It is a reminder simply of what makes America great and what makes us the envy of the world. Alexis de Tocqueville said it best: "America is great because America is good. If America ever ceases to be good, it will cease to be great." Nelson takes us on a historical, yet very inspirational journey of not just our founding values, but the men and women who walked them out and brought America to be the great light it is in the world over the past 240 years. Every woman lives by a code, whether she realizes it or not. It informs how she treats others and herself, how much she expects of herself, and how far she is willing to go in order to find success. But is the code we're living by truly helping us create the lives of purpose and fulfillment we desire? Or are we sacrificing the deeper things for mere achievement? 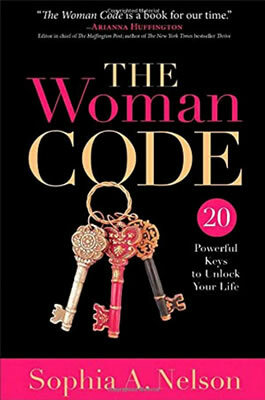 In this inspiring book, Sophia A. Nelson calls women to live out a powerful life code that will lead them to purposeful and successful lives. With the wisdom that comes from experience, Nelson reveals to women. the true meaning of "having it all"
The Woman Code is a way of living, of navigating life's challenges, and of interacting positively with other women. It's a way of pursuing our dreams and our deepest desires. It reveals a universal and timeless set of principles of the mind, body, and spirit that help women balance the demands of work, home, family, and friendship. The Woman Code not only calls on women to practice purpose in their lives, it shows them how to do it with grace. It’s time for a REDEFINITION among black women in America. In its 2011 hardcover release, Black Woman Redefined was a top-selling book and took home a 2011 Best Non-Fiction Book of the Year Award from the African American Literary Awards. Author Sophia A. Nelson won the 2012 Champions of Diversity Award, given each year by diversity business executives in Fortune 100 companies. In Black Woman Redefined, Nelson sets out to change this cultural perception, taking readers on a no-holds-barred journey into the hearts and minds of accomplished black women to reveal truths, tribulations, and insights like never before. This groundbreaking book provides black women of a new generation with essential career and life-coaching advice. Based on never-before-done research on college-educated, career-driven black women, Nelson offers her fellow “sisters”—and those who know, love, and work with them—a feel-good volume for personal and professional success that empowers them without tearing others down.